“Why boarding school?” This is the question I have been answering for almost thirty years, first as a student and now as a seasoned admissions director. The answers to this question are just as varied as the kids who decide to attend. The most dramatic change that has occurred during my tenure in boarding school admissions is this: it is no longer about parents sending their kids to boarding school. Today, kids are choosing to go away to school. The internet and social media have made it possible for information about boarding schools and their transformative power to reach kids who otherwise wouldn’t have entertained the idea. (Thanks to Harry Potter alone, more kids today know about boarding schools.) Personal testimonies from students, parents, and alumni are powerful and relevant, and there is valuable data available which corroborate their experiences. When I was a boarding school kid in the late ‘70s and ‘80s, many of my peers were sent away to school by their parents. Some were expected to follow in their fathers’ and grandfathers’ footsteps; there were others whose only alternative was to leave home because of family issues. Not to say that these reasons don’t apply today, but they don’t represent the majority. More often than not, today’s “helicopter” parents want to keep their children home to enjoy and witness their growth and involvement at school. Even those parents who entertain the boarding school choice often dictate a list of schools their child is allowed to consider. Usually that list is influenced by proximity to home: the closer the better. Who are these kids who seek out boarding school? They are kids who place a premium on pursuing their passions. I have interviewed prospective kids who just had a powerful experience at a summer residential enrichment program like the Talent Identification Program at Duke University (Duke TIP) or the Johns Hopkins Center for Talented Youth and are looking to continue that intellectual journey during the regular school year. I have also seen kids who have attended overnight summer camps for many years and are hoping to replicate the intimate community they have come to love. Some kids just want to escape a local school system that does not offer them challenging courses. Others continue to consider boarding because of family tradition. Many kids are serious athletes who learn about the rich tradition of excellence and competition in sport at our schools, and appreciate not having to hide their scholarly selves. Then there are those who leave their countries to be immersed in the English language and American culture. And, yes, there are some who take advantage of the opportunity to repeat a grade to join their emotional or chronological equals. What all of these self-selecting students share is a willingness to change their current circumstance and own the decision to go away to boarding school to become more independent. These kids who choose to go away to school are vested in proving to their parents that they can be away from home on their own and make good decisions. Several prospective candidates have told me that they had to resort to a PowerPoint presentation to convince their parents to allow them to apply. Others have shared that their parents wouldn’t help them with the application process: setting up the interview, registering for the SSAT, and following up with teachers who promised to write recommendations. The result is that today’s boarding school culture is defined more by the majority of students who are making good decisions and less by those who are not. This healthier student culture is evidenced in a precipitous drop in the last few decades in the number of students who leave boarding school before graduating. That said, another reason to consider boarding school is that the school day is purposefully designed to allow students to have their cake and eat it too, so to speak. The schedule allows for the coexistence of academics, athletics and the arts. Students are able to pursue rigorous academics without having to compromise their love for an extracurricular endeavor. The myriad extracurricular options are impressive and couldn’t be exhausted by even the most ambitious. Musicians can join an orchestra and ensemble. Athletes can compete with and against future collegiate and professional athletes, and thespians can grace the stage in a theatre dedicated to the performing arts. All three groups experience the thunderous cheers and applause of loyal classmates who show up to support them. Imagine it: everything is right here. No longer do parents and students have to re-arrange their lives so that outside school extracurricular expectations align with school demands. A boarding school’s schedule is designed to allow students to be involved in the arts and athletics with little to no conflicts. Most teachers also coach. There is a built-in sensitivity to helping students balance their workload with their extracurricular pursuits. Suffice it to say, it is not a bad deal for parents who no longer have to chauffeur their child to and from practices. Instead, parents can use the newfound time to pursue their own passions. Prospective students tell me they are looking for a deeper connection with teachers who care about them. Teachers who elect to teach in a boarding school are vested in the residential experience: most of them not only teach but also live in the dorm. Assisting students in the evenings with homework is the norm. Bonding over a meal, whether in the dining hall or in a teacher’s home, is routine. As a consequence, teachers and students establish meaningful connections that often last a lifetime. Ask any boarding school graduate to recall a teacher, coach, advisor or dorm parent. Don’t be surprised how many they are able to remember. I am still in contact with my advisor and many of my teachers from boarding school. When I was a dorm parent, my proctors and I watched “SportsCenter” at 11:00 every weeknight. It was our shared time. To this day one of them, now a graduate student at The Klingenstein Center at Columbia University, calls me for advice. Given the exclusive and elite heritage of the boarding school world, you might be surprised to know that today’s kids are choosing these schools because they want a diverse school community. Thanks to the generous amount of financial aid awarded to families, there are students from varied socioeconomic backgrounds. Roughly over a quarter of the student body at boarding schools receives some form of financial assistance. Further, boarding school students come from all over the United States. International students represent 17% of our student population, and they hail from over 36 countries. Pat Bassett, the former president of the National Association of Independent Schools, often speaks of the 6 C’s—the six competencies that graduates need to excel: critical thinking, collaboration, creativity, communication, character and “cosmopolitanism.” Boarding school, where students from different cultures attend classes together and live in the same community, is the ideal environment in which to develop this cross-cultural competency. Attending boarding school allows students to set themselves apart in so many ways. It is, after all, a very small population that goes off to boarding school. And living away from family while at school provides the ultimate setting for independence, as well as the ownership of one’s learning. Is there any better preparation for college? Today’s boarding school students understand these benefits, and that is why they have sought out this environment. It provides an education that is intellectually stimulating and, because it is pursued alongside other kids who share their interests but not necessarily their socio-economic and cultural backgrounds, enriches their lives and prepares them for the future. And they are forming connections with caring teachers and peers that will last a lifetime. What was created to serve the elite has morphed to embrace and celebrate the passionately interested. 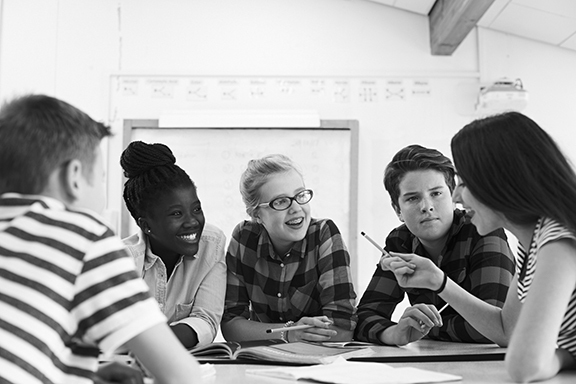 Boarding school isn’t for everyone, but students who are mature, organized, intellectually curious, and actively engaged in their communities are ideal candidates. Data and Analysis for School Leadership, National Association of Independent Schools. dasl.nais.org. Parents League offers advisory services for families considering boarding schools. Michael Gary is Director of Admissions at Phillips Exeter Academy, a 9th through 12th-grade boarding and day school in Exeter, New Hampshire. This article first appeared in the 2015 issue of the Parents League Review. Get the current issue of the Review free with a family membership. Or purchase it separately. What age should my child start preschool?